Published: Jan. 3, 2014 at 07:59 p.m. Updated: Jan. 4, 2014 at 03:15 p.m. The Tennessee Titans continue to handle their internal evaluation process at their own pace. NFL Media Insider Ian Rapoport reported Friday on NFL Network's "Around The League Live" that indications are Munchak will return for a fourth season with the team in 2014. A short time later, the Titans released official statements from president and CEO Tommy Smith and general manager Ruston Webster making it clear nothing has been settled. "I said all along that we would review every aspect of the football operations at the conclusion of the season -- in early January," Smith's statement read. "Today I sat down with (general manager) Ruston Webster and Mike and we discussed every coach and player on the roster. We had good discussions, but no final decisions were made." "The three of us (Webster, Smith, Mike Munchak) met all day today in Houston," Webster's statement read. "We had a good conversation in regards to the team and moving forward. Nothing final has been decided at this point, but we hope to have a decision soon." Signs point to Munchak coming back for the final year of his contract. Other changes could be coming on the staff, however. 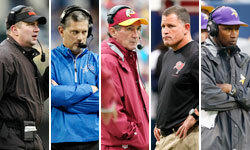 Gregg Williams is potentially in line to be promoted to defensive coordinator, while the fate of offensive coordinator Dowell Loggains remains very much in doubt. Team officials were unhappy with Loggains' pass-happy approach this season. Munchak publicly vouched for Loggains earlier this week. Munchak has been with the team since he was drafted by the organization -- then the Houston Oilers -- back in 1982, but his 22-26 coaching record since 2011 stretched the patience of the new Titans owner. UPDATE: The Titans have fired Munchak, according to Rapoport, per team sources.